Due to weather condition and heavy snow falls, I have to reschedule some planned work. I originally planned to sandblast entire wheelhouse area before welding new quarters. This was however not possible, so I moved to another jobs. 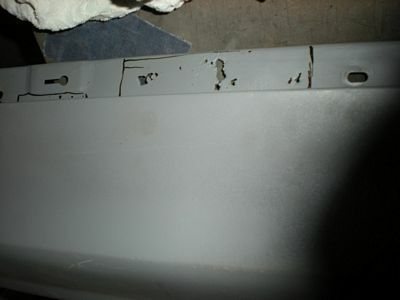 Passenger door post was to rusty probably due to water which get in between two overlap panels. 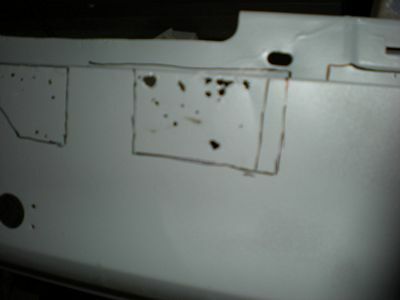 Unfortunately, there was some piece of car VIN stamped which needs to be cut away. 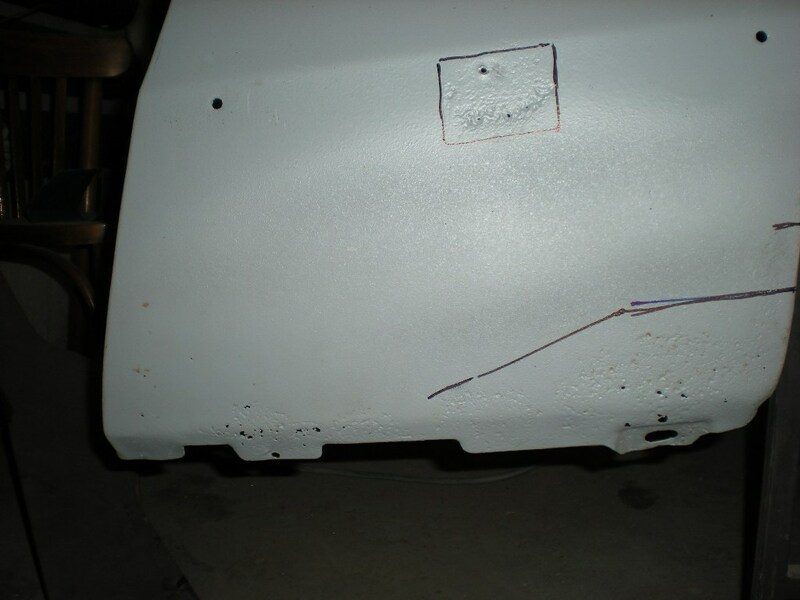 Here is damaged rear quarter lip. 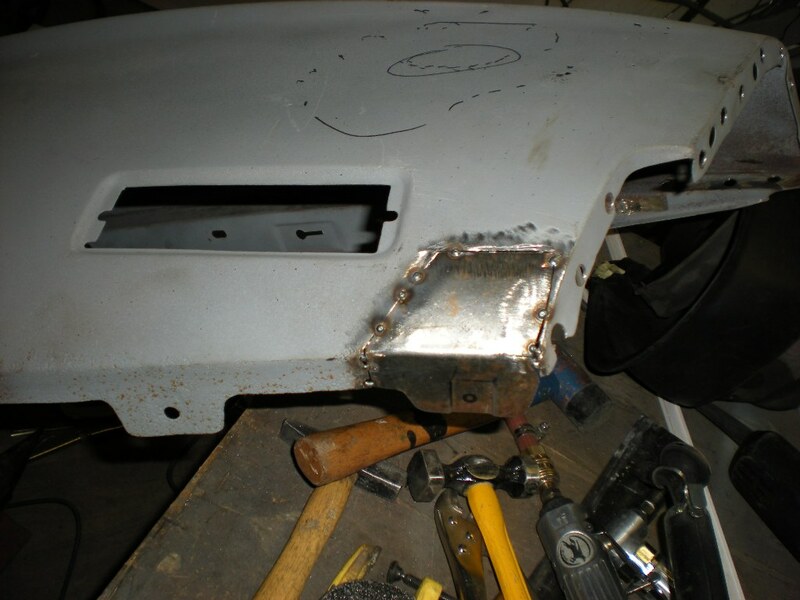 Some few more holes in the lower section. 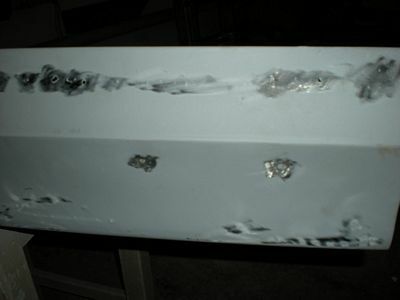 Middle section was badly damaged. 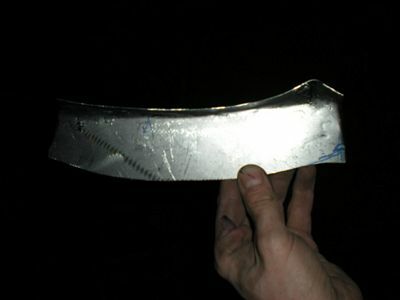 Here, the outer metal was already cut out. 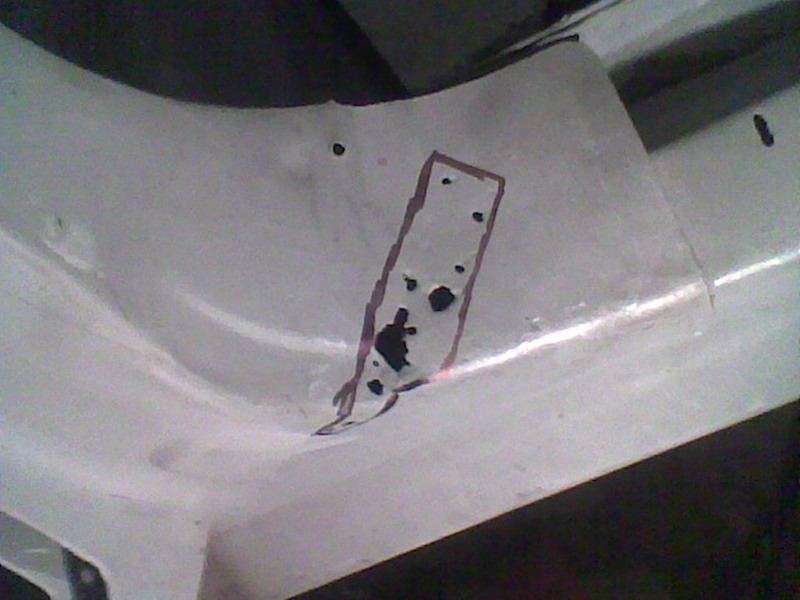 Here is the bottom part repaired by few patches. 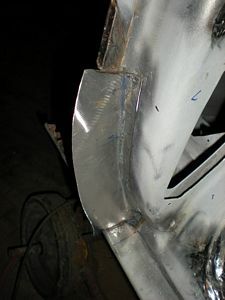 Top section welded. 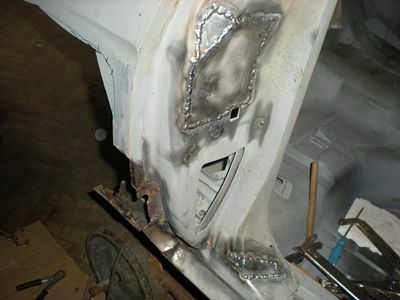 And grind the welds to perfect finish. The bottom part of quarter lip. 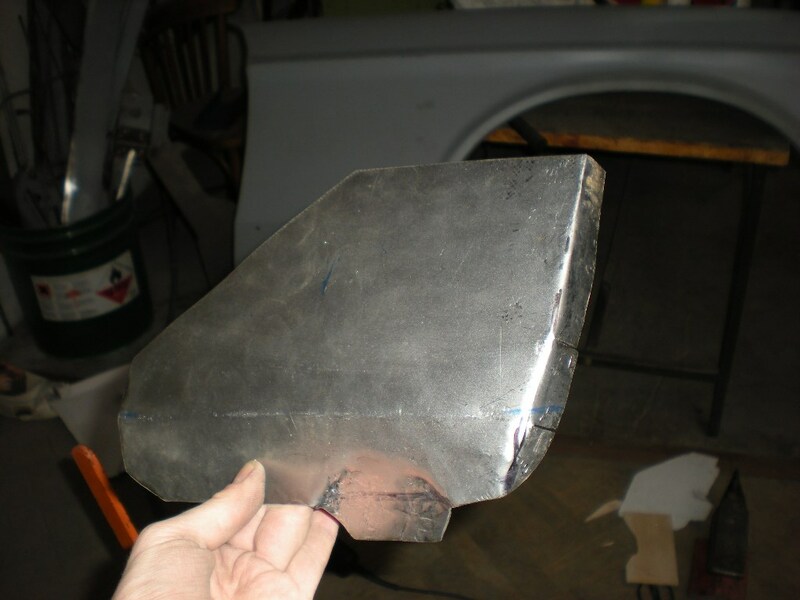 I was able to form it out of one metal piece. After several trimming cycles in place now. 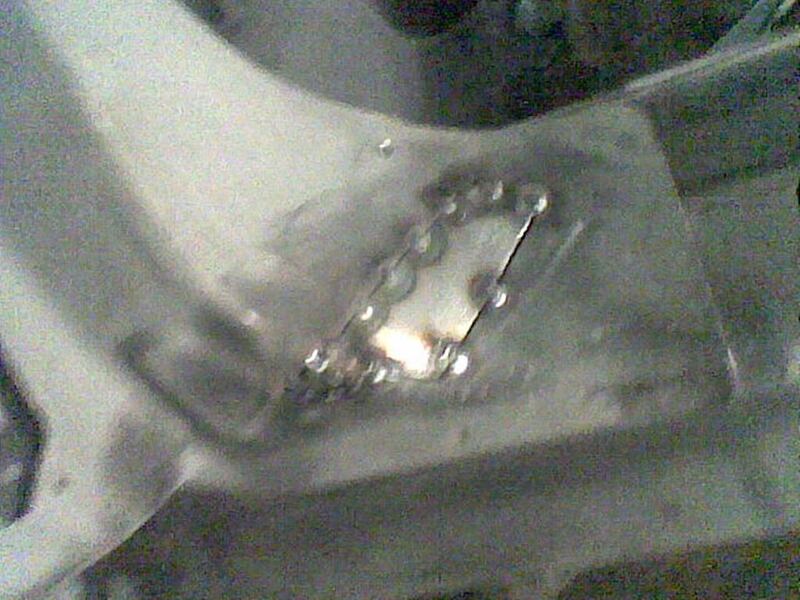 And here it is tack welded. Trunk lid was not in perfect condition even. 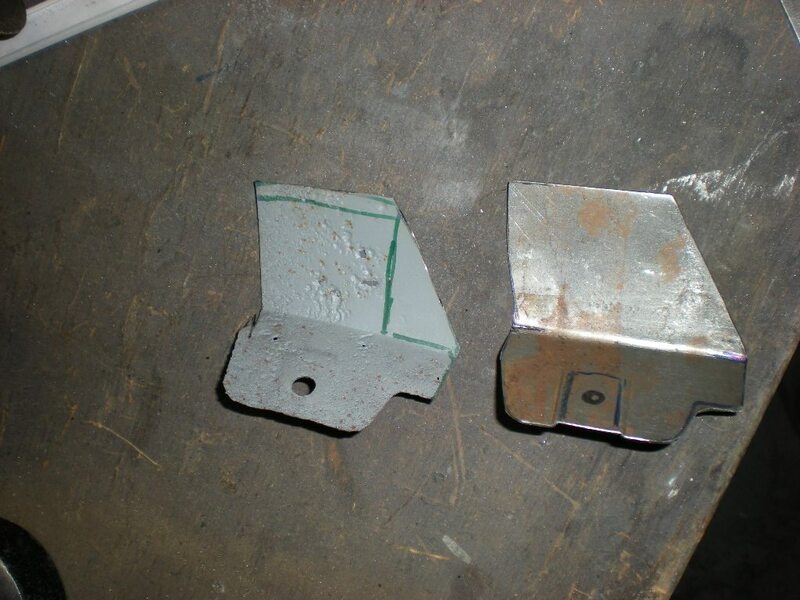 The inner cavities were not possible to sandblast. So the perfect repair would be difficult to achieve and best option would be to spend some bucks and purchase a reproduction part. I decide to do some compromise cosmetic repairs. 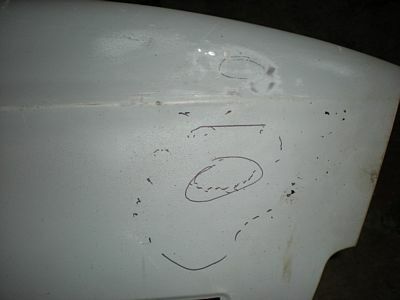 In worst case the trunk lid may be replaced in future. 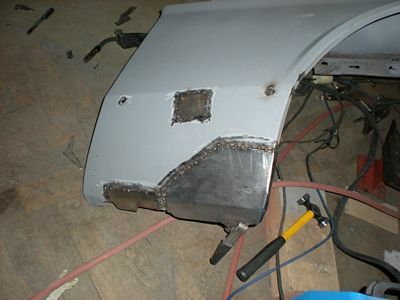 The trunk lid is now prepared for welding job. On rear part there were several 2mm holes. 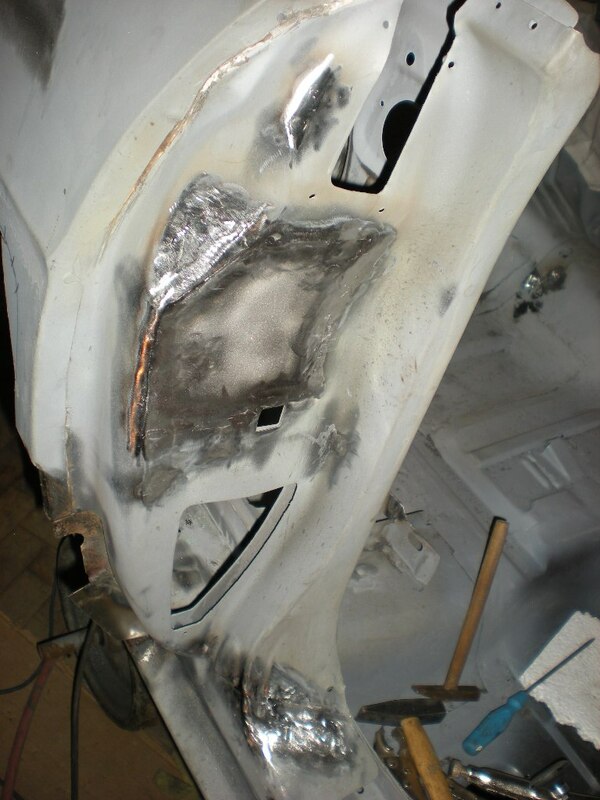 As a quick repair we just grind the primer to bare metal and weld the holes directly. On inner surface there were several rust holes. See especially damaged lip. Here is a temporary reinforcement of the rear part to make it straight. Then we cut the rusty part of the inner lip. Here we are continuing with welding the inner lip. 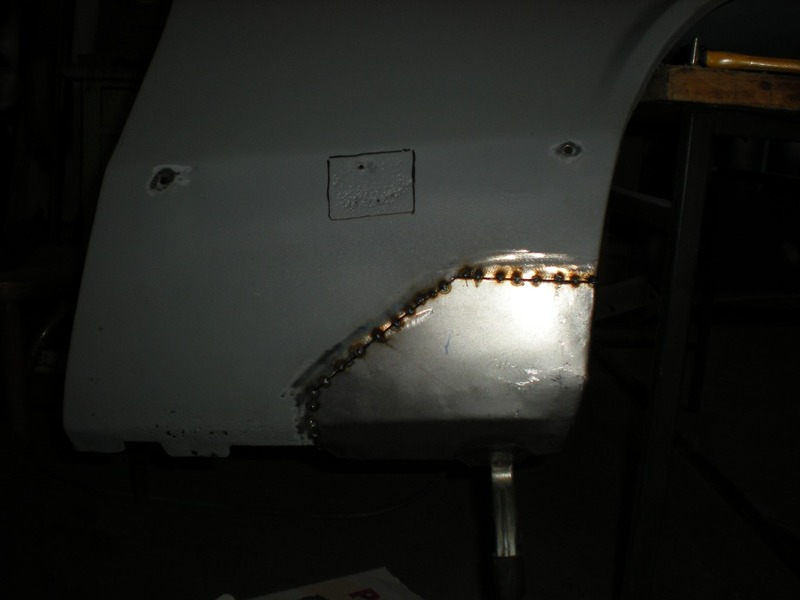 And then the overlapping stripe of metal was applied. Some extensive grinding and the result is nearly what I expected. 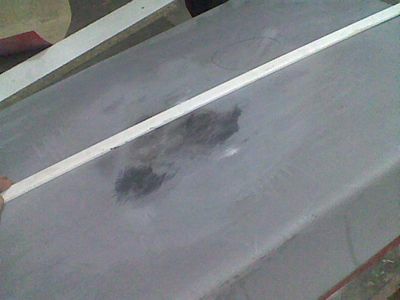 Sandbalsting unfortunately caused an oil canning problems on the top surface of trunk lid. The panel was wavy and the steel do not hold straight. The only way how to correct it is to shrink the metal. There are several methods how to achieve this. I am not an expert and I am just learning how to do these things. So I tried to use following procedures. This picture shows an experiment with hammering on the hard surface. Like a bag of sand might be useful as the force from hammer is spread out and do not damage the panel like on steel one. However this method was not useful at this stage. 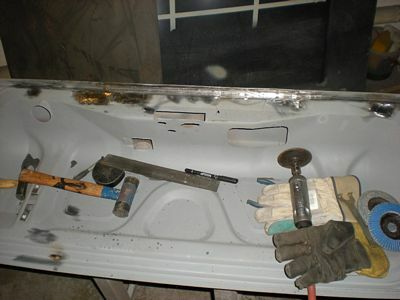 Probably the best and quickest method is to heat the panel. 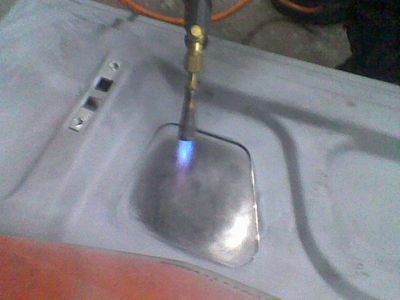 I used a propane torch and heat the metal until it turns into blue color. 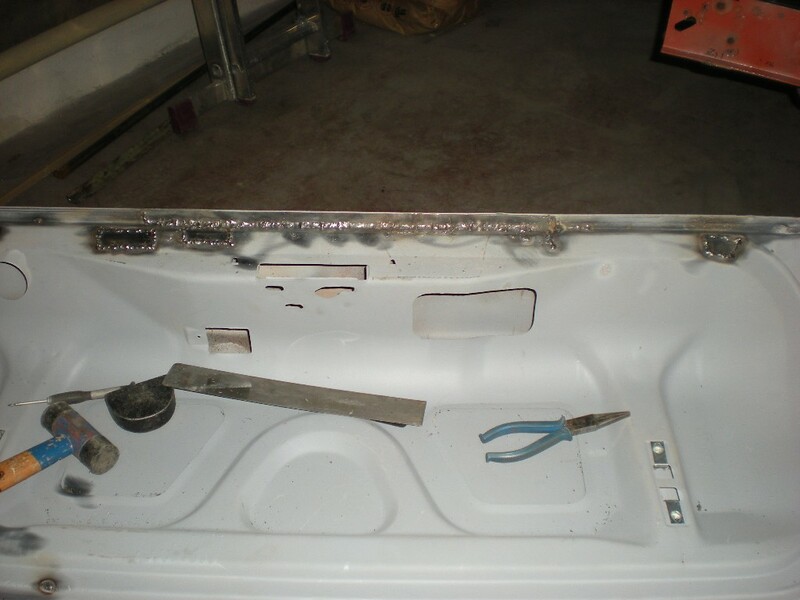 And just immediately use wet rag to cool the panel. This allows the panel to shrink and make it hard again. I used approximately 6 cycles on the entire area. Now the standard hammer and dolly techniques might follow up. Its good to check the progress with straight metal ruler and 80 grit sandpaper on flat wood block. 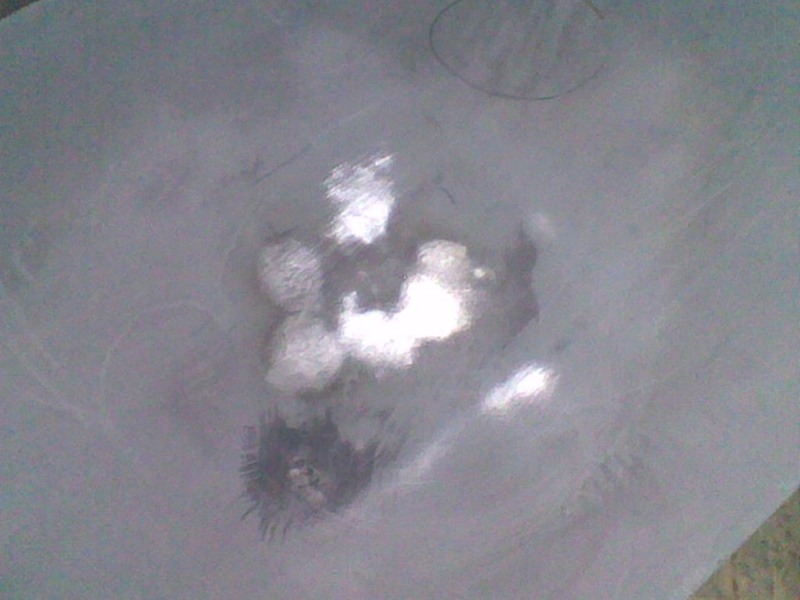 The shiny spots shows the high spots and grey the low spots. 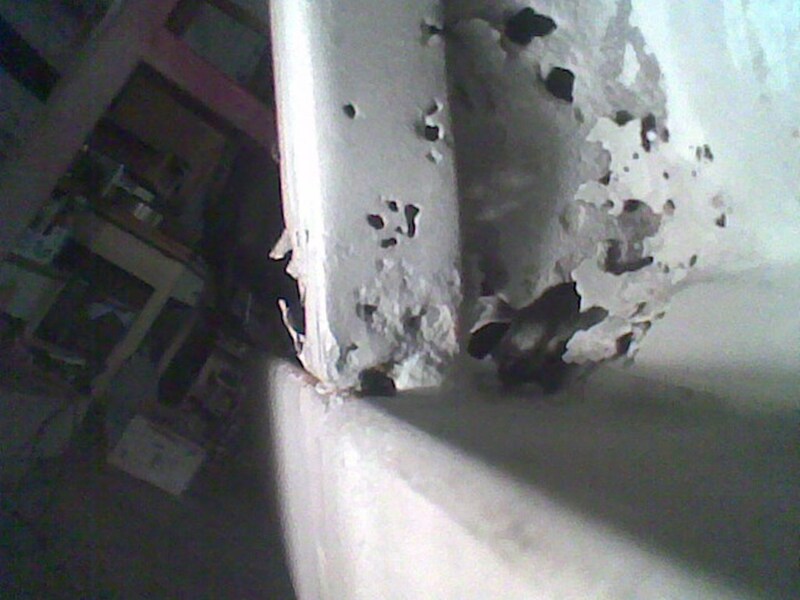 The surface difference are lower than 0,5 mm on this picture already. 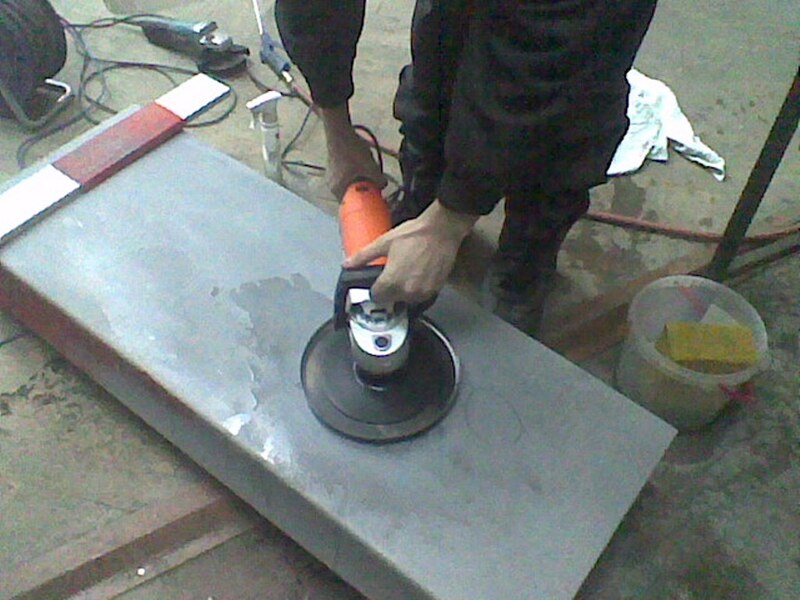 Final method to smooth the panel is a shrinking disc. This is a stainless steel disk which heats local hight spots. Just about 10-15 second of application is enough. 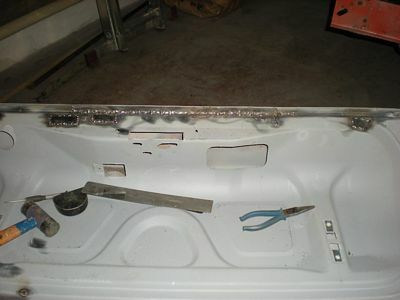 Then an cold wet rag is used to cool down the metal. Steam should be visible during this process. This allows the high spots to shrink very little. After several application the panels is very smooth. 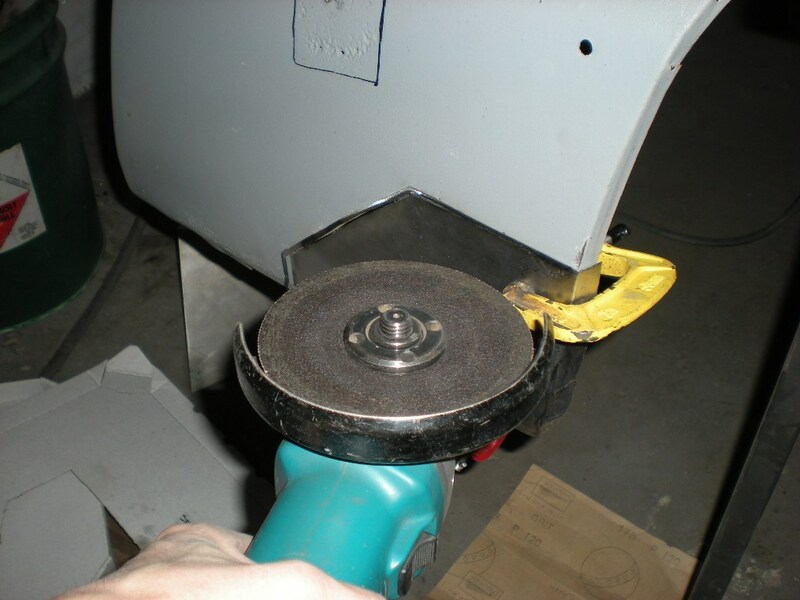 No need to worry of grind through the metal. 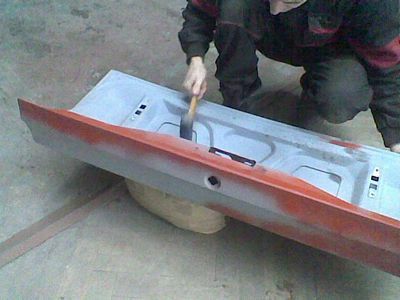 The experts can smoot the panel without using any filler at all. Here is the final checking with stipe of plastic rules which allows to show the contures. 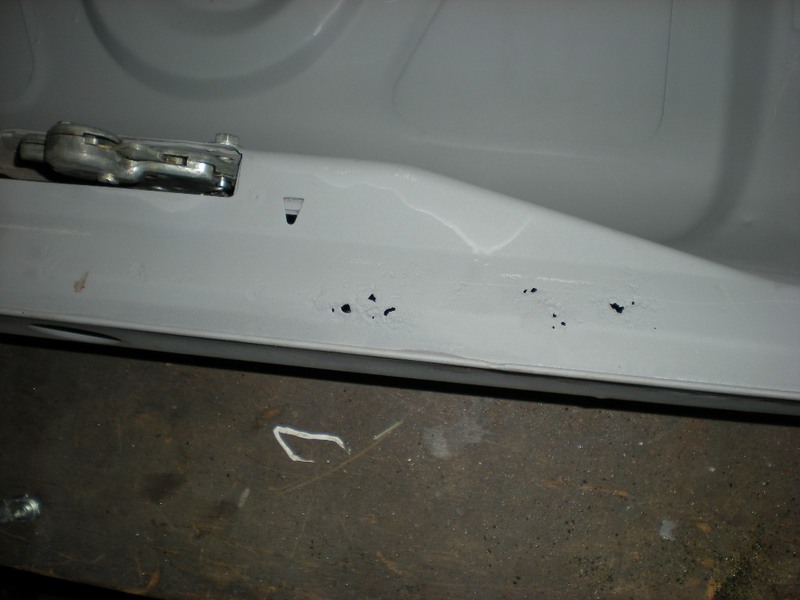 I just note a simple patch repair of the rear rocker panel. Rocker panels on the car were zinc plated and in general in pretty good shape except rear piece on driver side. Here it is old piece and new patch fabricated. 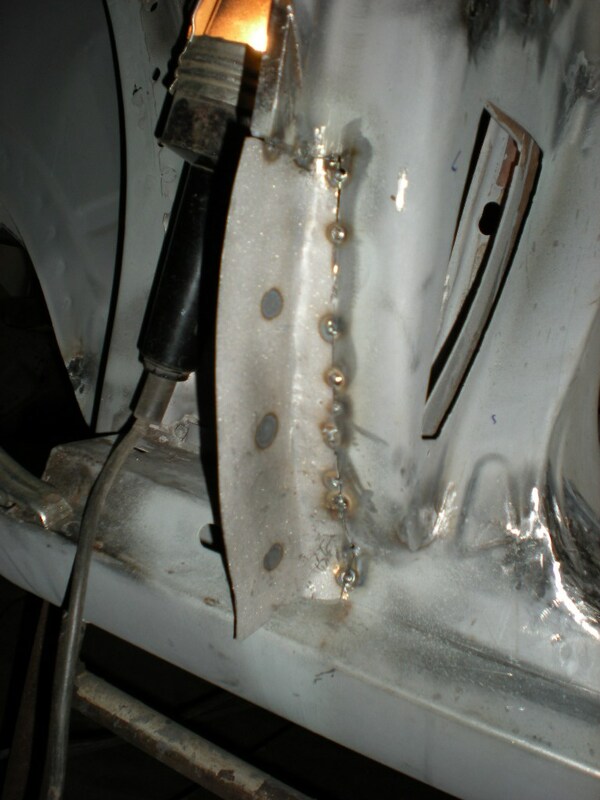 And here, it is tack welded in place. As with other parts even the front fenders were not in perfect shape. 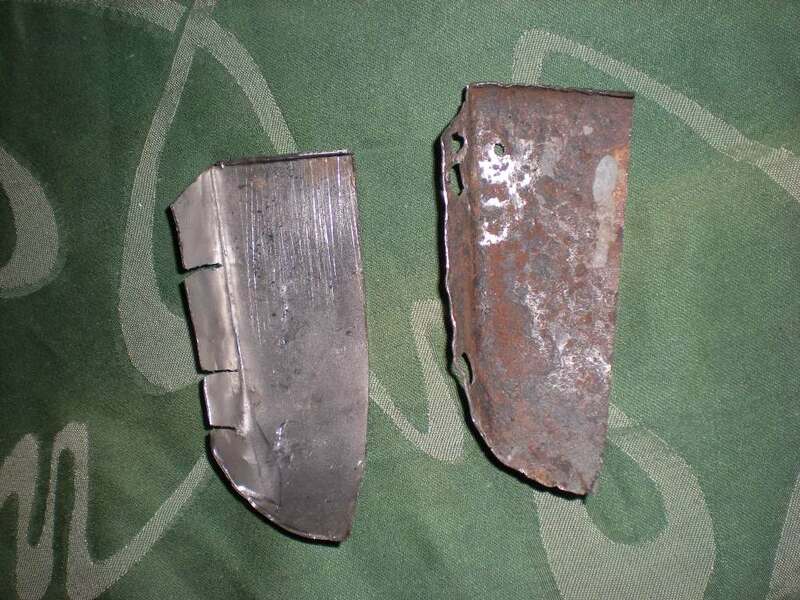 Rusted in the bottom and behind the reinforcement plates. 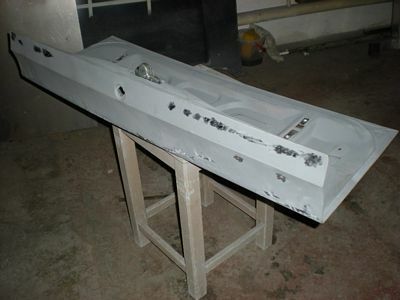 As well damaged by some collision in the past times. The new ones are pretty expensive so I decided to try to repair it. 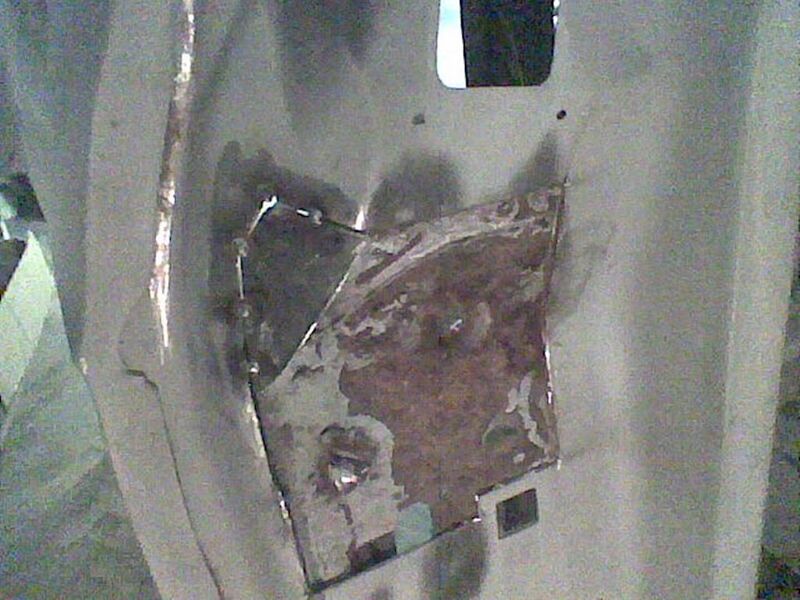 First I drilled out the reinforcement and head light brackets. Here is few pictures of worst places. In reality it's even wore then on picture of course. Front part is oil canned and rusty as well. 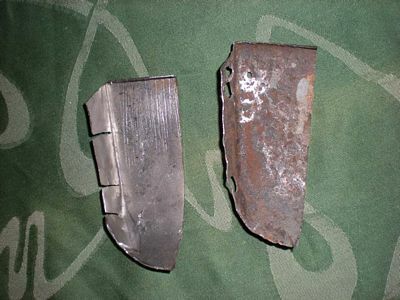 Top part is also very rusty. Another area for repair. I start with the lower extension repairs. I used a paper template to achieve the basic shape. Then use use 1mm steel for forming the patch. I placed it over the old piece and form it as much to the original. 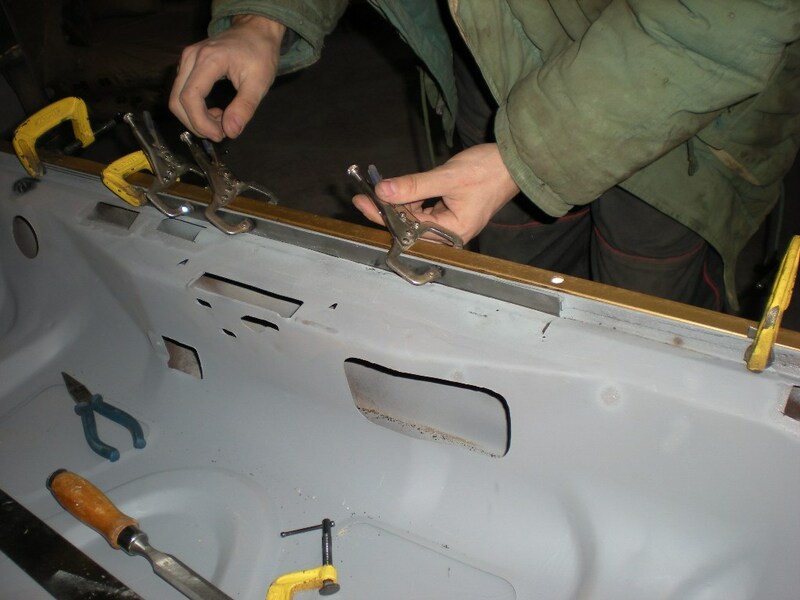 Finally I cut through both panels which allows me to make the best fit. Here the patch is tack welded. 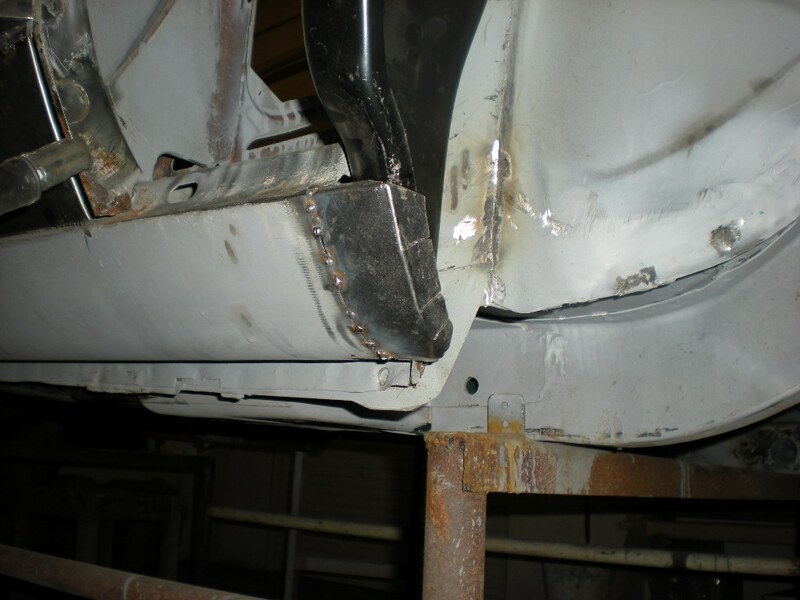 Its necessary to weld by small sections and allow to cool down otherwise this might cause a heat wrapping. The rear part is nearly finished. Here, another patch is prepared in front area. And tack welded. 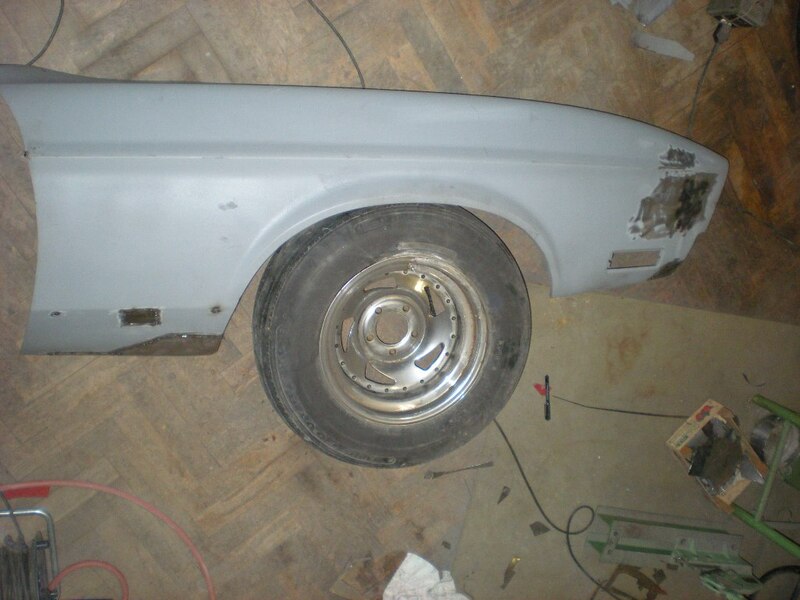 So this is actual condition ,Note: The wheel is just for demonstration purposes.